We've got five important races today. I'll get the results posted as quickly as I can. Bauke Mollema rebounded from the bitter disappointment one week ago when crashes ruined his podium chances at the Tour de France by soloing to his biggest, and first, WorldTour win in Clasica San Sebastian Saturday. "The last days of the Tour de France were really disappointing for me, and this was a good way to fight back," said Mollema. "I recovered well from the Tour, and I am really happy to win, I have always loved this race and finished in the top 10. This is the first WorldTour classic I have won; I have always wanted to be on the podium of this race and have one of those Basque hats, and now I finally have one." Mollema's advantage hovered around 10 seconds as the kilometers ticked away, and with three kilometers remaining it appeared the trio were about to tag him back. But no one wanted to make the last effort to close the gap, and his advantage grew again. Under the flamme rouge Mollema had 15 seconds, and in the final meters enough time to sit up and savor his first World Tour victory. 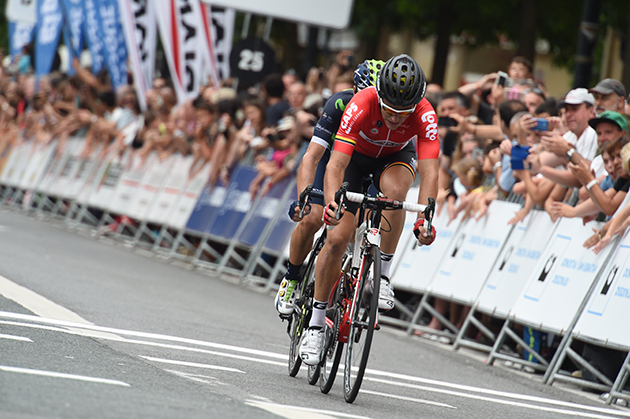 Gallopin won the sprint for second place ahead of Valverde, while Rodriguez missed the podium and settled for fourth. There was perhaps no better way for Mollema to stamp out the disappointment of the Tour than with a sweet victory in a race he has always held in esteem. Mollema next heads to Brazil for the Rio Olympics, a course that suits the on-form climber. Mollema: "I did not think about the Tour anymore today - I always like this race and I found the focus again this week and knew it was a good opportunity for me to make a good result. I think I showed I am in good form, this is a great result, and now the Olympics are coming and that is something I am really looking forward to." The final part of the cycling season started today with the 36th edition of the Clásica San Sebastián. It was a good test for most of the riders to see how the legs would be about one week after the Tour de France. The finale of this Basque Classic was slightly different from previous years. As predicted the Murgil Tontorra, a new climb on the course, was the decisive climb of this year’s edition. The traditional breakaway was formed almost immediately after the start. Six leaders obtained a maximum advantage of six minutes, that lead decreased a lot as the riders climbed the Jaizkibel for the first time. The front group was caught during the second ascent of the Jaizkibel because several attempts were made in the peloton. After that, it was Movistar that controlled the race and the peloton rode with full speed towards the final climb of the day. Adam Yates was the first rider to show himself, but his effort wasn’t good enough. In the meantime, Tim Wellens, Jelle Vanendert and Tony Gallopin were attentively at the front of the peloton. Several moments later it was Joaquim Rodríguez who attacked. Three other riders joined the Spaniard: Tony Gallopin, Alejandro Valverde and Bauke Mollema. Finally, Mollema managed to obtain a small gap at the summit as he accelerated on the last steep parts of the climb. The three chasers were unable to close the gap so the Dutch rider won the race after a solo of eight kilometres. Gallopin beat Valverde in the sprint and finished second. It’s already the third time that the French rider obtains a great result in this race (Tony won the Clásica San Sebastián in 2013 and one year later he finished fifth, LTS). Lotto Soudal eventually finished with three riders in the top-21, a very good performance. “The new ascent in the finale was short but several parts were very steep. It was important to be at the front of the peloton as we entered the climb. That worked out well with Jelle Vanendert and Tim Wellens by my side. I was able to follow the strongest riders on that climb and that really gave a boost. Mollema chose the right moment to attack. Rodríguez and Valverde are two great riders but the cooperation wasn’t as it should have been. It was possible to reel in Mollema as we were about five seconds behind him at a certain moment. But it is what it is. First, I will enjoy a short rest period and then I'll participate in Hamburg on 21 August." Clasica San Sebastian is once again out of reach for LAMPRE-MERIDA, which never won the Basque race. In the World Tour event, 220,2 km with the traditional climbs of the Jaizkibel (two passages), of the Alto de Arkale (2 passages) and the hill of the Murgil Tontorra (-7.7 km to the arrival), the blue-fuchsia-green team obtained the 43rd and the 44th place of Ulissi and Petilli. However, the performance of the team of the sports director Marzano was quite good during the race: few kilometers after the start there were already blue-fuchsia-green colors leading the race, thanks to Niemiec who joined the breakaway of 6 members (in addition to the Polish rider, there were also Moser, Janse Van Rensburg, Lang, Roson and Chetout). Their maximum advantage was 6'30", which were reduced in the approach of the first passage on the Alto dde Arkale (147,8 km). The gap was bridged by a group of counter-attackers on the second passage on the Jaizkibel (-35 km) and in this group there was also Ilia Koshevoy. Soon, the peloton reached the head of the race and LAMPRE-MERIDA did not succeed to be protagonist in the final part of the course, when Rodriguez attacked on the steep hill of Murgil Tontorra and Valverde, Gallopin and Mollema followed him. 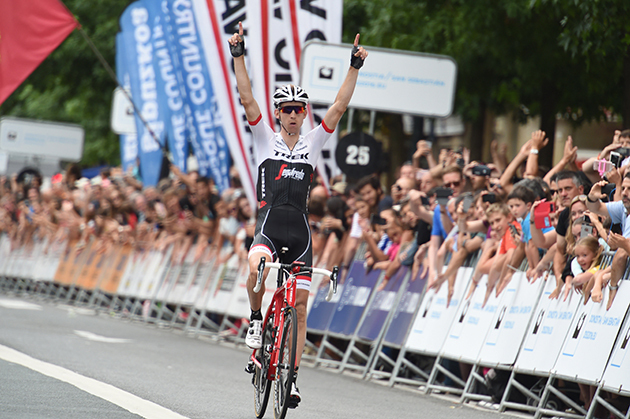 Mollema went clear in the downhill and he obtained a solo victory. "In the first part of the course, we succeeded in realizing what we had planned in the race program - sports director Marzano commented - Niemiec was in the main breakaway, Koshevoy pedaled with the counter attackers, however in the final part of the race we missed to be in the front of the group. Ulissi had no good feelings, Bono and Mario Costa gave their good contribution. For Petilli, this was an interesting debut. We can not be satisfied for the result in this race, except for some personal highlights". ORICA-BikeExchange will benefit from an immediate injection of climbing pedigree, signing Spanish rider Carlos Verona for the remainder of the year and the 2017 and 2018 seasons. Verona joins the Australian outfit from Etixx – Quick-Step and an agreement between the teams will see the 23-year-old line up in his first race for ORICA-BikeExchange at the Vuelta a Burgos this Tuesday. Despite his young age, the Spaniard already has almost six years as a professional, four seasons at WorldTour level and three Grand Tours worth of experience behind him and is expected to play a strong role in the team’s general classification ambitions moving forward. “I really like the direction that the team has taken towards focusing on the GC in the big races and the approach they have taken has been extremely impressive to watch,” he continued. I consider myself a team player and I look forward to contributing and playing a role wherever the team can use me. 30 July 2016, Santa Rosa, California (USA): BMC Racing Team will race at Vuelta a Burgos for the first time from 2-6 August, with former winner Samuel Sánchez as team leader. Sports Director Max Sciandri said Sánchez will be supported by a strong team, some of whom will use the race as preparation for the Vuelta a Espãna. "Vuelta a Burgos is a great race to do at this point in the season as it offers a bit of everything when it comes to the stage profiles across the five days. We have a great team leader in Samuel Sanchez, who is a previous winner of the race, and we have a good opportunity with the Team Time Trial on stage 2. It's the ideal race for a number of our riders who will use this as preparation for the Vuelta a Espãna," Sciandri explained. Sánchez, who won the race in 2010, is looking forward to lining up on home soil. "The Vuelta a Burgos gives me five more race days before the Vuelta a Espãna. With the course profile and the line up of riders set to compete, it is an ideal race where I can get a lot a big workload in my legs and get used to the race pace again before the Vuelta a Espãna," Sánchez said. Rider roster: Jempy Drucker (LUX), Floris Gerts (NED), Ben Hermans (BEL), Daniel Oss (ITA), Samuel Sánchez (ESP), Peter Velits (SVK), Loïc Vliegen (BEL), Danilo Wyss (SUI).